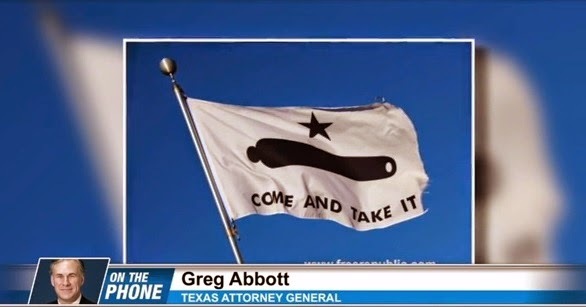 In the video below, NewsMax interviews Texas Attorney General Greg Abbott after he made headlines by telling the Bureau of Land Management (BLM ) he was prepared to hang a “Come and Take It” flag in Texas to tell the BLM to stay out of Texas after the BLM’s attempt at a federal land grab over 90,000 acres of land. Texas Governor Rick Perry is backing Abbott 100 percent and states that Abbott was not issuing a dare but was making a promise. Below Abbott makes it clear that the land grabs highlighted recently is indicative of the federal government run amok as he explains the audacity and illegal actions on the part of BLM, who was recently forced to back down in Nevada over a range war standoff at the Bundy Ranch, but not before images were spread across the Internet and national news of them slaughtering cattle, dumping them in mass graves, abusing Bundy supporters, throwing them to the ground, tasing them and destroying private property and much, much more.